What’s the fuss about the cloud? More than just big fluffy life giving stores of water floating in the sky, today the cloud gives life to your computer. If you think of the cloud as a vast bank of computers you can use as and when you want to carry out tasks way beyond that of your humble PC then you understand what the cloud in essence is. You basically borrow their processing power to carry out complex time consuming tasks. Unlike having to own a server farm, like the 1990’s, today’s companies can harness the power of the cloud only when they actually need it. Driving down costs, accelerating development and making businesses much easier to scale and to attract investment into. Big words huh? We humans have never had access to such powerful datasets and analytics before. Without computers and mathematics we would be overwhelmed and powerless to make sense of the information. Software and the power of the cloud enable an unprecedented insight into statistical analysis. Result? Big data and the cloud are the future of almost all decision making – software, politics, commerce, you name it – people are harnessing data to drive decisions. What are the real benefits to using them? Size 18 font docs floating on clouds wouldn’t be too handy, but mass data available when ever and the most powerful computers you can imagine available to you at the click of a browser? – That is appealing. For business, the benefits are immediate and tangible. You can raise investment to create analytical platforms that 10 years ago wouldn’t have been feasible. Investors don’t like spending millions to build server farms ahead of revenues. SME’s get to make big bold plans reliant upon access to the cloud, plans they couldn’t hope to achieve without the processing power enabled by the cloud. End users get access to software and analytics that run faster, cost less, can be updated daily and don’t have to invest in hardware to run the software. They only need access to the internet. WHAT DOES THE FUTURE HOLD FOR THE USE OF DATA IN HOUSING? Data drives everything. Without knowing the likely impact of a decision people are paralysed and static. If you knew the road on the left was busy and the one on the right empty, yet they both took you to your destination, you would take the right. You processed data. Now make some investment grade decisions on a property portfolio that need retrofit measures to become compliant with legislation. What do you fit? Why? And how much will it cost? Is there something better out there? Who provides the service? How do you ensure best value? And is that solution best for all your stock or just a handful? Are there grants available? If so, who administers them? How do you communicate that information to your boss? The board? Your investors? Data empowers and enables exactly this sort of decision making process. 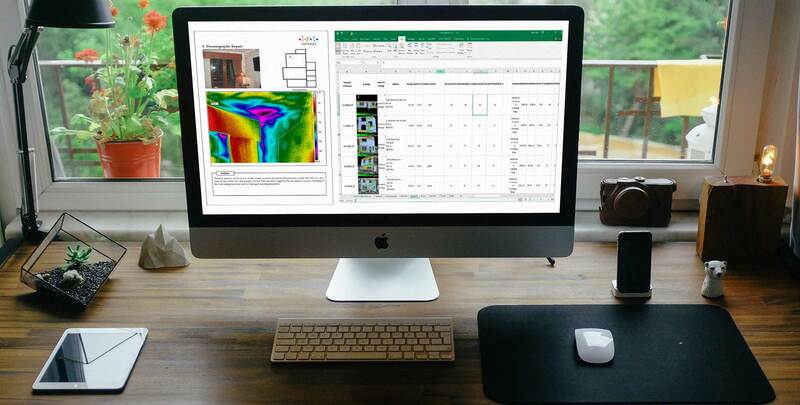 With the additional data the thermal image can provide in conjunction with IRT DREam, you can harness the true power of data and discover the most efficient way forward with your properties. Our users are loving DREam and its feature rich platform. DREam now has over 300,000 properties online with users benefiting from instant SAP calculations, mapping, target creation and reporting. With so many features to choose from we've compiled a list of the Top 5 most used and talked about. Our unique drag and drop property importer takes the hassle out of data transition. Users can drag a csv file into DREam and watch the updates and uploads happen before their very eyes. DREams cloud based calculation engine can multiply itself in reaction to the amount of data being uploaded, this means there is no lag or delay whilst processing data. Each property set is assessed and missing data backfilled. Whenever properties are uploaded, DREam maps the information directly into google maps by colour coding the streets the same as each EPC rating. This allows users to quickly see the extent of their stock and identify regions of interest. Because we use the Google map engine users can quickly switch to Street view to see the actual property and check the location and access. IRT have also created a range of overlays which include areas of deprivation, benefit likelyhood and gas pipeline network. Once the property information is on our cloud based system users can filter quickly and efficiently. From either the map environment or data tables, users can select the exact criteria of property they are looking for. Simply use the drop down options to find all matches in the portfolio. Search examples include finding E,F & G rated Solid wall construction properties within a specific postcode which also require a loft top up. Once a user has identified a particular set of properties they are interested in they can simply create a new group containing only these. This exclusive group can then be shared with colleagues, contractors or consultants allowing them to view only that specific information. Uploaded your data, mapped it, filtered it, grouped it, shared it - whats next? Simply take your group and create a Target. You can choose to learn how to reduce the energy, CO2, kWh or achieve compliance with regulations, meet a specific SAP or EPC rating. Once set DREam will instantly carry out multiple SAP calcs and find the most efficient way to achieve your target. These calculations are not biased towards specific products or manufacturers and just gove you the facts you need to make an informed decision. What info is req’d & where do you get it from? What info is assumed? When it comes to asset management software, today’s housing manager is spoilt for choice, which can actually have a paralysing impact on the customer – too much choice can be a bad thing. Watch a dad who has been sent to Tesco to buy nappies for his new born to see what I mean! It’s important that the software you chose is fit for purpose and agile enough to change with you, scalable yet simple to use. There are lots of platforms that have developed over decades that have so many limbs they resemble a Hindu God! Yet there a few that are embracing the cloud and more agile business models like software as a service – SaaS for short – to give the user a better experience. Admittedly, the choice is rather limited if it’s energy advice you require and smaller yet if its impartial advice you need and positively tiny if you would like to automate much of the workload entailed in leveraging grants and optimising budgets. IRT are 16 years old this year, in fact we just celebrated our birthday in January and we have been working within the social housing sector for the majority of that time. Listening to the challenges of the sector and working hard to help our client overcome the hurdles, understand legislation, makes sense of data and try our best to ensure they spend their money wisely. The culmination of our experience led us to develop two software platforms that deliver a similar thing, but in two radically different ways. But let me back track a little if I may. One thing we noticed in the sector was the variety of software and data out there. Plenty of clients are using Microsoft Excel and Access as their asset management tools, whilst others have invested hundreds of thousands of pounds developing their own bespoke software. Many small providers can’t afford the latter and see the risks in using the former and end up using a decent off the shelf tool, but then spending years trying to shoehorn their own agenda into something that was never designed to do what they are attempting. There surely is a Goldilocks (this software is just right) amount to spend on software? Excel is free (ish) but in-appropriate. “Bespoke” ties you to a developer for evermore and adding limbs to a top heavy torso is expensive and recipe for instability. DREam is a fresh, new, innovative energy analysis platform designed from the ground up for the social housing sector. It’s an online, cloud based, subscription model. It’s fast, low cost & license free. No software, no hardware upgrades and no limit to the amount of houses or users – it really is a new way of assessing your stock. The DREam process begins with you uploading your data online. You create an account, login then drag and drop your asset register into the engine. What happens next will save you years of heartache. DREam backfills the blanks in your data with intelligent assumptions from a database of over 250 dynamic, elastic, templates. We will show you, transparently, how many assumptions it has had to make. EPC’s, EI and SAP ratings are calculated for each home in turn. Properties are geotagged to enable a simple visual interaction too. The front end of the software shows a clear red, amber, green analysis of your portfolio. A simple, high level overview of performance. Lift the bonnet and look a little further and you can delve deeper into the platform and play with your stock. Mapping tools enable rapid aggregation of homes and simple automated development of retrofit programmes with a known ROI ahead of any spend. What’s more DREam can automatically alert you when retrofits become economically viable or are legislatively requires. You can update information quickly and easily too – and DREam will re-run SAP and EPC calcs instantly. Ensuring you are always upto date. Always with your finger on the pulse. Handy, if a merger is looming too. You may want to have an infrared survey carried out for a variety of reasons. Infrared thermal imaging technology is ideal for detecting defects and energy deficiencies of buildings and housing stocks. Combined with drone technology, it becomes a limitless tool. Let's take a closer look at drones. 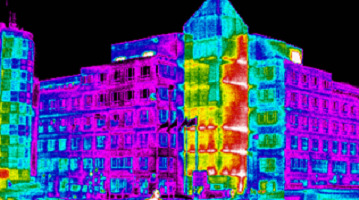 For 14 years IRT Surveys have been surveying buildings using infrared thermographic (IRT) cameras. Mostly on foot. This means that when it is a high building or a flat roof which needs surveyed, equipment such as cherry pickers have to be hired. This has cost implications for our clients and Health & Safety implications for our certified thermographers and anybody or building in the surrounding area. Radio controlled tethered air balloons: wind and power lines make them impractical. Telescopic pneumatic mast bolted to a van: a relatively successful technology that IRT Surveys used for years. Ideal then to capture an entire flat roof in a handful of images. The downsides are time-consuming set up, dangerous in windy conditions, and taking images at weird and unexpected angles. Also from a practical point of view, parking the van at the correct location for carrying out the infrared survey can be problematic. The whistling noise created when driving the van is also distracting. Today, masts are largely a thing of the past thanks to other technological advances. Radio controlled helicopters have been around for years, but are difficult to fly and terrifying with the blades and internal combustion engines wiring away. Nowadays we use drones. IRT Surveys have a small fleet of drones in the UK operated by CAA approved, ITC qualified thermographers with night-time licenses. Drones are a breeze to fly and present at least three main advantages. Drones are safe and get the camera to places that are cost-prohibited by any ground based system. From a high vantage point we can also cover large areas in a short window of time. They are therefore ideal for tall building and flat roof surveying. They are capable of carrying thermal imaging cameras better than handheld ones to heights that neither a mast nor a cherry picker could reach. The flight plan can be programmed on a tablet allowing the drone to fly largely autonomously . Since it’s usually us humans that crash the things, this can only be a good thing. As with any technology, they aren't perfect and and their future will be determined by regulation. Many companies are investing in anti-drone technology now to shoot drones out of the sky. We shall see how this materialises. The thermographer must have the permission to survey the buildings, the owners/tenants and neighbouring buildings of the activity. An area adjacent to the surveying site must be cordoned off for take-off and landing. A qualified operator has to provide his permissions to operate with certificate from the CAA. Without this the operator will not be insured. They has to carry out risk assessments that are site specific. Finally they also need thermography experience in order to capture the correct data and setting up the correct parameters required for the job in hand. What does the future hold for the use of drone technology in IRT surveying? Like all emerging technologies, the sector is full of “give-it-a-go-heroes”. Fast forward 5-10 years they will be gone, the market consolidated and a handful of professionals left doing it properly. For IRT surveys, it is a nice thing to have available to us. Still 95% of our surveys are still done on foot by thermographers at night in low wind. Maybe down the line when you call we will simply deploy a local drone to your building and not need the skilled local thermographers to actually take the pictures at all. Their role will become one of convincing you it’s a good idea and to talk you through the findings and recommend solutions based upon technical knowledge and experience. Looking in the short to medium term, at IRT Surveys, we can’t see the drones replacing a skilled human just yet though. But like the humble hammer, there will come times when you need a drone. It is always handy to have the tool in your box. Do you have high buildings or flat roofs which require surveyed with thermal imaging? If so, please do contact us for a fast, impartial and clear survey. In the social housing provision, decisions for housing stock retrofit are persistently made based upon very little knowledge about the energy performance of housing stock in question. The consequence is that often the results are not what was expected or promised. The popular statement “rubbish in, rubbish out” applies in this sector too. Whether you are thinking about changing lightbulbs on 50 houses, or merging your stock with a neighbouring housing asssociation, wouldn’t it be good to ascertain the value and condition of your own assets before those decisions are made? Let's look at the influence of atmospheric conditions on thermal imaging surveying. After tech & science, colours, price and company selection, the last episode in our educational series tackles a favourite subject in the British psyche: the weather. Thermal imaging or infrared surveys are a hi-tech solution to building surveys. They really do move the game on from traditional methods of surveyors with clipboards or tablets relying upon decades of experience, but they are not infallible. Where a surveyor can survey in all weathers, infrared thermal imaging (IRT) is a bit more sensitive to moisture, temperature and humidity. As you are ostensibly taking a picture of energy radiating from an object it makes sense that you don’t want anything to interfere with that radiation. Although the word "radiation" may make you raise your eyebrows, it is all safe. If you have nice dry homes, with the heating on, the sun set two hours ago, it hasn’t rained that day, there is little wind, no fog or mist, then you can survey away and you will get awesome results. The best atmospheric conditions for thermal imaging surveying are: after sunset, little wind, no rain, fog nor mist, and the heating on inside the houses. Even with the current excellent weather forecasting capabilities, the best atmospheric conditions are often unpredictable. What can happen and how does it affect IRT surveys? Turn up the wind however and all that lovely radiating energy will be blown from the surface you are trying to measure. Poop. Wet the surface and double poop. The water cools the surface and absorbs the energy, then radiates it but with a different emissivity to the dry bits. Switch the heating off and you lose the difference between inside and outside. As a result, the energy has no incentive to move, so your thermal imaging surveying results will be poor. You will think the building is perfect. Think about sitting in your lounge nice and cosy; the door to the cold hall gets open and suddenly the lounge feels cold. Why is that? That is due to the large difference in temperature, the heat cannot wait to leave and warm up the hall. Keep them both at the same temperature and you won’t experience this effect. Another example: Take your cup of hot coffee outside on a cold day. It will get cold fast! Your house is the same. The laws of physics and thermodynamics remain. Rain and humidity in general are real no-no’s for a professional thermographer. As IRT surveys, we conduct Continuous Personal Development (CPD) seminars up and down the UK every week for building surveyors raising awareness of the technology, its benefits and the optimal conditions to use it. We often ask people to think of their buildings inhaling and exhaling energy. To conduct an accurate defect or energy audit we need the building to inhale energy from the sun or your heating system, wait for it to absorb the energy then exhale. An infrared thermal image is an image of that energy being exhaled (or emitted). We can use big words, like thermal inversion, but we find it is better to use plain English in our communications and reports alike. If you need to commission a survey to detect energy deficiencies of for your house stock or inspect your flat roof, do your research and choose a thermal imaging company wisely. Once you have appointed your thermal imaging surveyor and they turn up to survey during daylight, rain or high wind , please protect your property and financial assets: get rid of them there and then. Contact us by clicking on the button below. As a housing provider, you are aware of programmes such as CERT, CESP, HHCRO, HEEPS, NEEPS, SEEPS, REEPS, EEC, EESH, ECO and GD and you will have heard of DECC, EST, OFGEM, BG, SSE, EON, SAVA and the CT.
For the lay person, these are meaningless acronyms but for the professional like you they are the essential grant funding schemes helping you to deliver your carbon obligations. The last five years has seen major companies and SMEs go into administration trying their best to gear up to service the industry only to find the rug pulled from under them as the utilities companies shift focus to deliver their carbon obligations: from cavity and loft insulation, to boilers, to external wall insulation and possibly back to cavity insulation again. For these companies, treading through grant schemes is like “tight rope walking in two tonne shoes” as Chris Cornell’s song goes. One false move and the company goes under. Focus on something hot right now and next month something else will be the new flavour. It is impossible to gear up for something that is fluid. The demise of the Mark Group and Climate Energy is a sad example of companies dependent upon regulations to survive. Yet, there are still vast sums of money available through grants to help housing providers save on their energy performance which in turn help people save money. Be aware of the legislation. Truly understand the state of your housing stock today. Have your housing stock data ready to react to whichever way the energy wind blows. Road map a savings journey to logically make the most of the funding and address your priority challenges. For far too long the local authority and housing associations sector has been doing their best Oliver Twist impression and going cap in hand to the utility companies asking for more. For you as housing manager, the result is that you get whatever these companies are willing to give. Things that meet their agenda, not necessarily things that best meet your requirements. If you get your data in good shape and can react quickly to the shifting demands of legislation then you will find the utility companies and contractors line up to help you. Your in-depth knowledge and understanding of your assets will make it easy for them to deploy their budgets and meet their targets. Knowledge will always be power. You can join the many local authorities and housing associations that have their 4 components worked out in that magic formula and accessing funding to make a real difference to their housing stock and their tenants’ lives. They are using powerful software tools that IRT surveys have developed to manipulate their housing stock data and combine it with the latest legislation obligations. To find out more about how these tools can help you ease the strain, contact us by clicking on the button below. Commissioning an infrared thermographic (IRT) survey is easy. We tell you here what you can expect during the survey process so that you have a stress-free IRT survey. We have already pointed to a few strategic reasons why you would commission an infrared survey. We have been providing infrared services to the construction professional sector in the UK for 14 years and the reasons are wide and varied but can be distilled down into 3 main headings. You have a problem and nothing else seems to be helping resolve it. You are not sure if you have a problem and want an expert opinion. You definitely have building issues and no-one can agree who is to blame. More often than not you are seeking a reactive survey to a problem which manifests itself in a new building or refurbishment project. IRT surveys is often called upon as a “silver bullet” solution. Managing your expectations as a client is part of what’s involved in the process. Most of our clients have little technological knowledge of IRT. They rightly rely on us to know what we are doing and wrongly do sometimes ask impossible things. No, we cannot find a leak on a roof from a satellite in space. You need a thermal imaging camera mounted on a drone and a thermographer for that. The technology has its limitations. But you will be blown away by just how useful a tool IRT is for the maintenance of your site. Here are the 4 common expectations from our clients that we systematically need to address if we want you to have a stress-free IRT survey. We have already discussed the technology and science behind IRT. Today’s cameras are digital, radiometric (every pixel has a value), portable, un-cooled and affordable. We use FLIR cameras. They fit in our pocket and can be bought for less than £500. That alone is great news for us all. Don't expect great resolution as this is still way behind that of your average smartphone though, but that will change. Fast forward 10 years and they will be embedded in every smart phone. Your expectation: 'The survey will be conducted as soon as I submit the purchase order'. How do we take an image properly, i.e. an image you can rely upon to make an investment-grade decision? Once you have established your need to get a survey done and contacted us to describe your problem to one of our team members, you decide to proceed. Your deadline will be our major hurdle. The weather is the biggest challenge we have. We need the right conditions to carry out a successful survey. No point promising you that it will be on your desk tomorrow if it is raining today and is too windy the next day. We need cool, dark, dry evenings to take thermal images. This means that you will have to wait until the weather conditions are correct. The shape and height of your buildings are not a problem: with our fleet of drones we can survey tens of thousands of metres of flat roofs in under one hour. We even take care of the civil aviation and insurance bureaucracy. Access to your premises may be a problem though. We need to be able to see the entire fabric externally, internally, in daytime and again at night time. Sometimes special entry permission are required as invariably there will be out-of-hours access required. You need to make sure that security personnel has been informed, that someone is available to open and close the doors, that required authorisation has been given and recorded. We can't enter premises without this, and will have to come back if we can't get access, hence delaying the survey and the reporting. Once thermal images of your building have been captured, depending on the size of your project, there is in general up to 5 days worth of skillful analysis to be conducted. We don't take this lightly and do make recommendations based on the findings so that you can target repairs or refurbishment. This is what your infrared survey report is here to deliver: visual results and impartial advice so that you can make informed decisions. With trouble-free access, the right weather and up-to-date equipment, we stand an excellent chance of successfully meeting your objectives. If you are contemplating stripping off a flat roof on the advice of your flat roof leak survey report you are paying for, you best make sure you can trust the company providing that advice. Used properly, IRT is an amazing technology which can save you thousands of pounds on your maintenance budget. By knowing what makes a valuable survey and its subsequent report, you are guaranteed a stress-free IRT survey experience. Are you looking to refurbish your buildings and don't know where to start? We will be happy to advise you. Please contact us for your free no-obligation quote by clicking on the button below. 1. Time for your asset portfolio audit: You don’t trust the data you have. 2. Time for your asset portfolio audit: You have a merger looming. 3. Time for your asset portfolio audit: Your client wishes to dispose of their assets. 5. Time for your asset portfolio audit: Legislation presents a risk. In a previous blog we explored how an IRT camera can see energy, but quantifying it for energy loss, that is the Holy Grail for thermographers and something that can be done. In fact IRT surveys received a patent for just that back in May 2013. It’s not easy though and it’s not idiot-proof. Here we will reveal just how we do that. Today’s IRT cameras are digital and radiometric. That means every pixel records a value when you take an image. Every pixel is a temperature. A typical camera then has about 76,800 thermometers. Because everything is digital those temperatures are stored as metadata behind the visual bit of the image. So what? Well, this data can be accessed and interpreted. If you record how far away you were from the object you photographed then, with basic trigonometry, we can tell you the size of a pixel. Once you know the size, it’s easy to add them up and say 'You have 2.15M of red pixels on your wall'. That’s not quantified, I hear you scream. Hold ‘yer horses, I say. Step two involves capturing other data beyond the cameras abilities. How do you heat the building? What’s the emissivity of the material - in other words, how readily does it emit its energy? Over the past 6 years we have developed 250 elastic templates we can move around the country. Stretching or shrinking them to fit clients buildings. We need to augment known variables from energy software such as SBEM, SAP, Energy Plus or EIS into the algorithms to arrive at a meaningful quantification. Weather data from the last 25 years is built into the models. Our software re-calibrates itself to allow for differing internal temperatures constantly. Eh? What I mean is, when we survey 1000’s of homes we can’t ask all of them to be the same temperature inside, rather the software has the ability to moves its expectations. Double-eh? Missing insulation makes a difference of about 1-2 degrees to the surface of a wall. The difference between 18 and 19 is 1. The difference between 21 and 22 is also 1 – so we focus on the difference (the delta to get all “mathsee” on you).